Kyrie Irving has an arsenal of secret tricks that make him great at basketball, but his latest reveal may be his most surprising edge yet—his own personal donut. 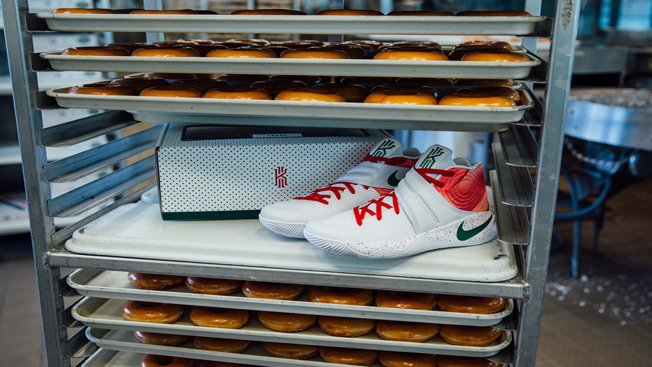 In a new R/GA ad from Nike's Kyrie 2 sneaker, the Cleveland Cavaliers point guard promotes a special-edition design of a Krispy Kreme-themed shoe—the Ky-Rispy Kreme. 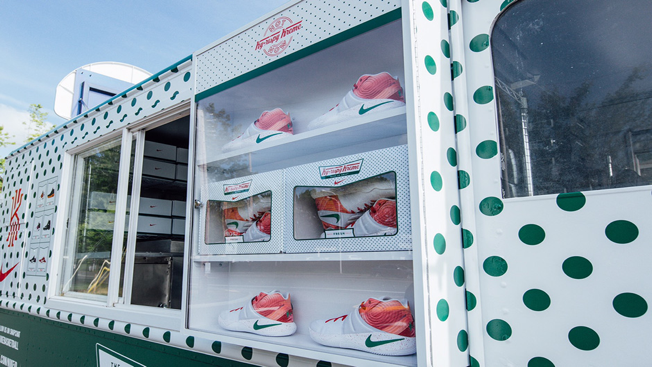 A traveling truck, meanwhile, has been distributing small numbers of the glaze-and-sprinkle-themed shoes in Cleveland, Baltimore, Manhattan and Brooklyn. The commercial, which is part of R/GA's "Unexpected Moves" campaign for Nike, joins other spots featuring Irving's hard-to-explain wordplay-driven advantages, like an arcane math equation, the ability to turn into a human torch (which anyone who grew up playing NBA Jam will especially appreciate), or unique karaoke powers—certainly one of the best fake mid-game celebrations ever. In this particular instance, it's great to watch Irving stuff his face with sugar-laden rings while trying to explain why they—or rather, their rubber-soled offspring—are so important. A string of onscreen question marks, marking an inability to translate his donut-muffled praise, makes for a brilliant sneaker-head sales pitch … because in the end, the performance doesn't really matter so long as they look good, and they do. Campaign: Kyrie 2 "Unexpected Moves"
Spot: "Unexpected Move #79 – The Kyrispy Kreme"